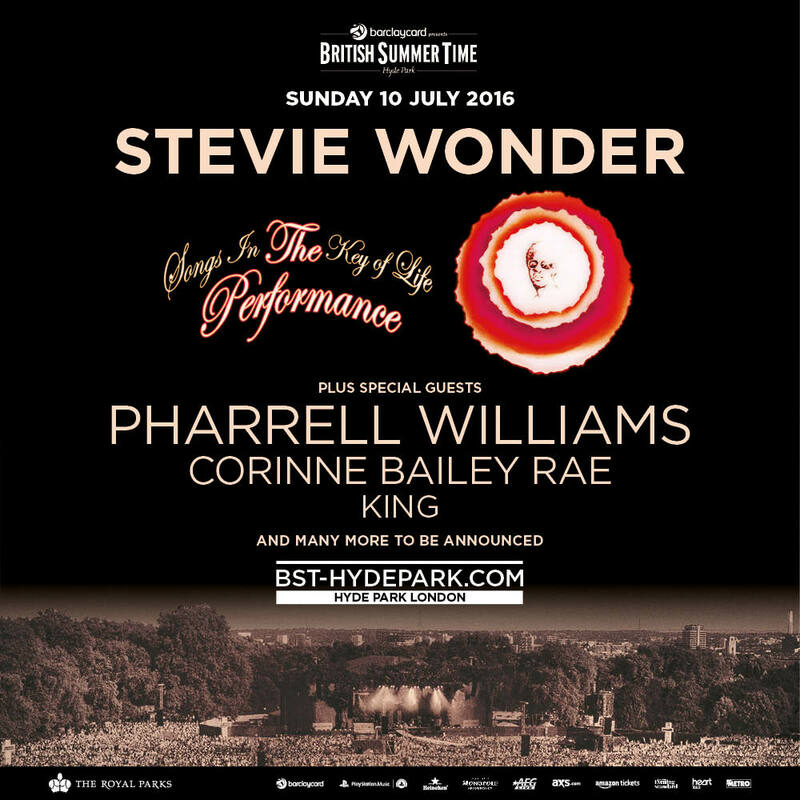 Following the announcement that Stevie Wonder will take to the stage in Hyde Park to perform his masterpiece Songs In the Key of Life in its entirety, Barclaycard presents British Summer Time Hyde Park are excited to announce three spectacular new additions to the Sunday line-up. But fans should act quickly as this amazing show is nearly sold out and the last few tickets are going fast. Considered to be one of the world’s most prolific producers and performers, Pharrell Williams is the first new addition to the Sunday billing. The force behind so many incredible smash hits, including Kelis’ “Milkshake”, N.E.R.D.s “Lap Dance” and of course 2014’s Grammy-Award winning and feel-good track of the year “Happy”. Pharrell has worked with music legends from Britney to Justin Timberlake, Daft Punk to Snoop Dogg, and will be sure to drop it like it’s hot this summer. Of Stevie Wonder, Pharrell has said - "Stevie Wonder was a fixture in my life as a child. His music is probably the closest thing to auditory transcendence." Joining Stevie and Pharrell on the main stage is soul-singer extraordinaire Corinne Bailey Rae. The BRIT-nominated and two-time Grammy-Award winning artist rose to prominence with her breezily beautiful singles “Put Your Records On” and “Like A Star”, and has since released two albums, her multi-million-selling eponymous debut and the Mercury Prize-nominated The Sea. With her brand new studio album The Heart Speaks In Whispers out for release on May 13th, Corinne’s uplifting and charismatic performance - described last week as “mesmerizing” by the Evening Standard - will be the perfect soundtrack to a Sunday evening in Hyde Park. Also taking to the stage with their “nu-soul” sound is Los Angeles-based KING. The trio is composed of sisters Paris and Amber Strother and Anita Bias, whose whooshing synths, spiraling harmonies and detailed songwriting create a truly unique and jazzy sound – one that has been compared to the likes of Solange Knowles and Estelle. Pharrell Williams, Corinne Bailey Rae and KING will all join Stevie Wonder to form an incredible line-up for the day of soul and R&B. The hot new additions to the line-up follow the announcement that Stevie Wonder will perform his masterpiece Songs In The Key of Life in its entirety, for a truly epic, must-see show from one of the most prolific artists of all time. Tickets for the Barclaycard VIP Summer Garden, the Terrace, the Ultimate Bar and other hotel and premium ticket packages are still available.